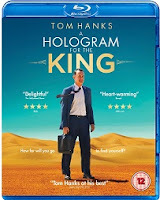 A Hologram For The King is released on DVD & Bluray September 19th. And to celebrate we have a great competition for you and 3 copies on Bluray to give away. Light-hearted comedy drama starring Tom Hanks as struggling American businessman Alan Clay. Desperate to recoup lost earnings and pay for his daughter's tuition fees, Clay travels to Saudi Arabia in an attempt to secure a lucrative IT contract with a wealthy Saudi king. 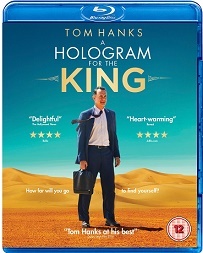 After discovering on arrival that the king hasn't visited the development in 18 months and, facing the sack, Clay must find the money and willpower to make his project a success and turn his fortunes around. The cast also includes Ben Whishaw, Sarita Choudhury, Tom Skerritt and Sidse Babett Knudsen.